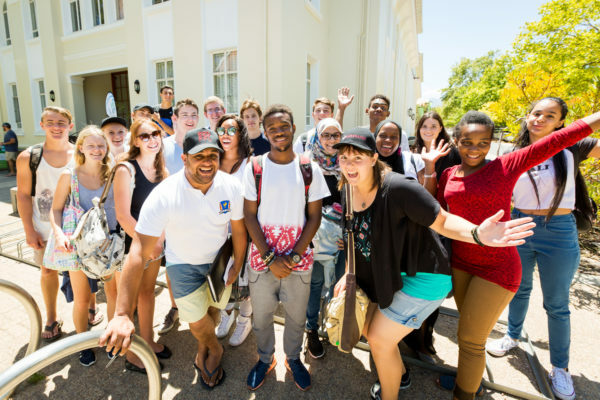 More than 5000 newcomer students, accompanied by their parents, will descend on Stellenbosch this week to start their academic journey with Stellenbosch University (SU). Although many students, especially those who stay in residence, will start to move in from Wednesday (23 January), the Welcoming Event, to be held on Thursday at 17:30 at the Danie Craven Stadium, will mark the official start to the Welcoming Week. The new Maties will amongst others meet the University’s mascot, Pokkel, while they will also be addressed by Prof Wim de Villiers, Rector and Vice-Chancellor, and Ms Carli van Wyk, SRC Chairperson. Students will then gather on the field to form a massive “2019”. This symbolises the newcomers integration into the new community they will become part of. A new addition to the programme is the newcomer marching from the stadium to Victoria Street on the campus as part of a “Dream Launch” that symbolises the start of their journey to realise their dreams. The students will each receive a card on which they can write their dreams for themselves. These cards will then be placed at various points on the route, especially in Victoria Street. A further highlight of the Welcoming Programme is the annual “Vensters” event taking place on Friday 1 February. For these colourful outdoor performances, residences and private student organisation (PSOs) partner up to impress audiences with innovative and creative dance performances around a central theme. The University’s website, www.sun.ac.za, contains all the necessary information for newcomer students. The full week’s welcoming programme and information on amongst others the registration schedule, transport, personal safety, the library, free writing advice and transport are available here.